1) Anyone can enter. Anyone can vote for their favourite poster. 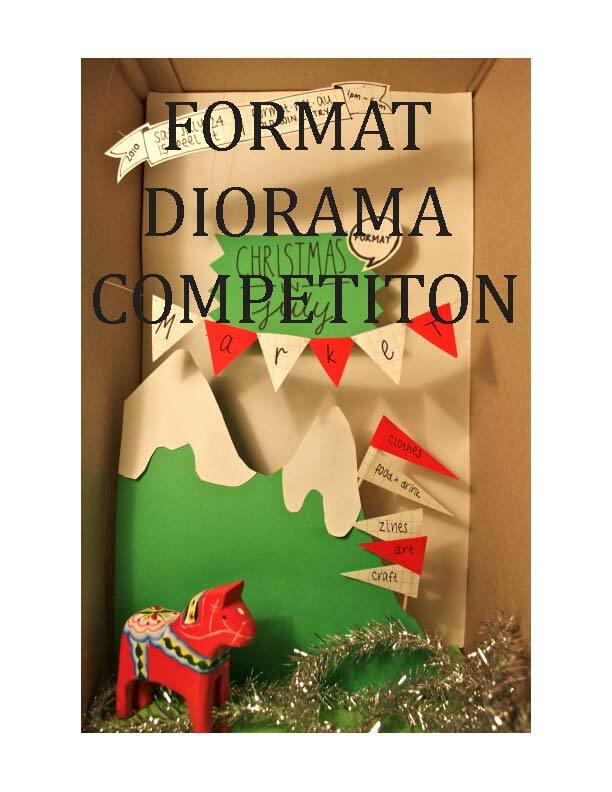 2) To enter, make and photograph the diorama you’d like to see on the Format Festival poster. It could have anything in it – miniature people, mountains, the ocean, knives, live wolves. For an example of a great diorama see the above image of our Christmas in July Diorama-Poster designed by Stephanie Lyall. 5) The four dioramas with the most *Like*s will be used as the Format Festival 2011 posters. If you don’t have facebook and would like to vote, let us know at contact@format.net.au. The winners will be asked to provide their diorama for professional photographing. ALL dioramas entered in the competition will be featured in an exhibition at the opening night of Format Festival 2011, so hang onto your dioramas! 6) Make sure to press *like* for your favourite dioramas! You are allowed to vote for more than one.